I like to draw with fountain pens. Now that I’ve discovered the joys of Noodler’s inks (a full post on those coming up soon) I have felt the need to buy a few more pens. I own now a mix of around a dozen pens, of which I keep 6 inked at all times. It’s a bit much. When I’m sketching I find I reach for one pen over and over again. That pen is my Pelikan Pelikano medium point in blue. I keep it inked with a blue or a blue black ink at all times. There is nothing special about this pen. It’s an inexpensive school pen that lays a nice medium line and a lot of ink. It’s comfortable and easy to clean. I’m not worried about breaking it or tossing it around because it was pretty cheap. The important parts about this pen for you to know is that it has a medium point steel nib, it is what is referred to as a “wet” writer, in that when it puts down a line of ink it’s generous in the amount of ink in that line. This means my blacks are truly black and I can blend those lines with a wet brush. The steel nib is stiff and doesn’t have much line variation but can be abused. I’m not gentle with this pen. I tend to have a heavy hand and it takes that abuse and keeps on writing. The body of the pen is translucent frosted blue plastic. It’s not gorgeous and it’s not ugly, like most school pens it’s functional. You don’t want to have a pen your classmates will steal, they won’t steal this one. The cap is brushed steel or aluminum with a plastic clip. The pen isn’t going to win any design awards but it works. This pen is a cartridge or converter pen. I hate cartridges and I’m not overly fond of converters, each holding 1ml of ink, sometimes less. That’s not a whole lot of drawing for me. I converted this one to what is called an eyedropper pen by using outdoor grade silicone caulking to plug the 2 vent holes in the end of the body. The body now holds 3ml of ink, which is a whole lot of sketching and drawing. While not a difficult job it was a tad fiddly to do but has held up for several months of sketching and drawing. Alternately someone could refill the cartridges with a syringe. I’ll tell you about a couple of other go to pens I use for drawing soon. Here is a picture I drew using this pen and a few others as well as a brush pen. 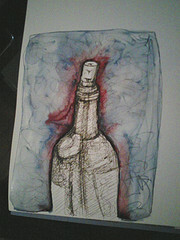 This entry was posted in Review and tagged drawing, fountain, ink, pelikan, pelikano, pen, review, tools on 20110203 by leslie.